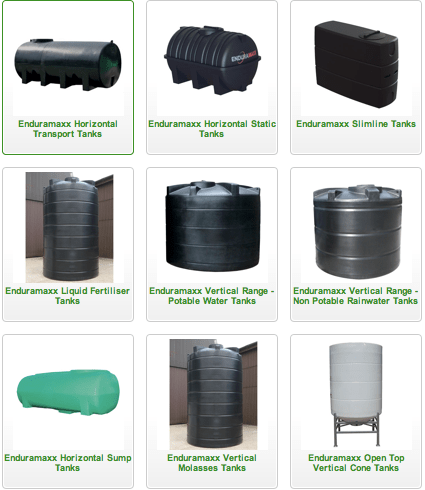 Chris has been a very busy bee and has updated the website Enduramaxx Tank product listings, to reflect the updated EnduraTank branding, and the wider range of tank sizes and specifications available. We hope that you will find the listings easier to navigate as the categories have been separated, making finding your ideal tank even simpler. The expanding tank range now covers Horizontal Transport (cartage) tanks, static tanks, slimline tanks, Potable and non-potable (suitable for rainwater harvesting) tanks, molasses tanks and cone tanks. The accessory and parts range comprises of Spare lids and outlet fittings, camlock fittings, ball valves, tank & can washing equipment, hoses and clips, sumps and catchment trays. You can find the whole range here on our website, but if you need any help in selecting your tank then please do not hesitate to contact us for advice and guidance! This entry was posted in New Products and tagged cone tanks., Enduramaxx tanks, enduratank, Horizontal Transport (cartage) tanks, molasses tanks, non-potable tanks (suitable for rainwater harvesting) tanks, Potable, slimline tanks, static tanks, tank fittings, www.agratech.co.uk on January 30, 2015 by agratech.